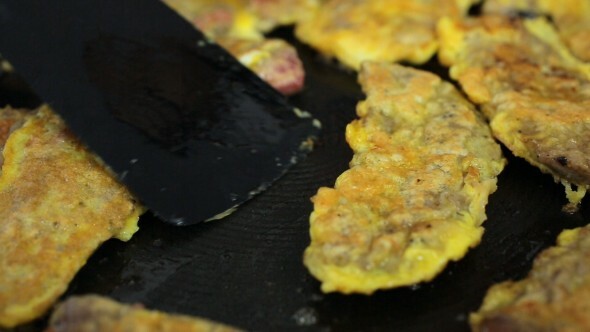 Today let’s make some soegogi-jeon, or beef pancakes. 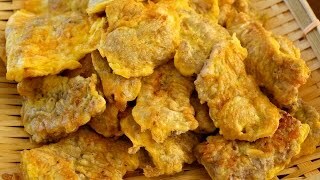 It’s a super-simple recipe that pretty much every meat eater loves: nice, tender beef sliced thinly, battered lightly in flour and egg and pan fried quickly. 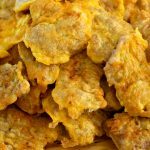 The result is light, meaty, savory, golden brown, and really delicious. This is a Korean side dish (banchan) recipe meant to be served with rice, and I used to make it all the time for my children’s lunchboxes, like the one I make in the video. However they also go well with noodles and are a big hit when paired with beer, too. It’s best to make these on the spot and eat them right away, which makes them a perfect go-to when guests drop over. But you can also make them ahead and break them out when you need them. Just be sure to give them another quick pan fry before serving, just to freshen them up again. Enjoy the recipe, and enjoy some beef pancakes! Slice the beef thinly into bite size pieces ¼ inch thick. Lay them on a large cutting board or a tray, spaced so they don’t touch one another. Sprinkle 1 teaspoon salt evenly over the slices. Add the minced garlic using your fingers, spreading evenly on each slice. Add the ground black pepper evenly on each slice. Drizzle the sesame oil over the beef and spread it evenly on each slice with your hand. Place the flour in a bowl next to the cutting board. 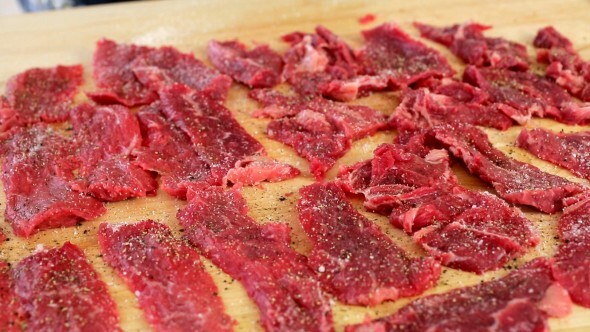 Pick up one slice of beef, coat it on both sides, and then put it back onto the cutting board. Repeat with the rest of the beef until all are coated. Crack the eggs in a bowl. Beat them with a pinch of salt until they’re well mixed. Heat up a non-stick pan over medium heat. Add some cooking oil and swirl it around in the pan to coat it evenly. Dip a beef slice in the egg mixture and put it in the pan to cook it. Repeat with more pieces until your pan is full, but not crowded to the point that pancakes touch each other. Cook for 1 to 2 minutes until the bottom is slightly light golden brown. Flip it over. Let it cook another 1 to 2 minutes. Remove the cooked pancakes and keep them in a basket or on a large plate while you cook the rest. Be sure to wipe down the pan with a clean paper towel between batches so the pancakes don’t get brown as you cook them. Serve it as a side dish for rice, noodles, or liquor. You can refrigerate leftovers up to 3 days or freeze up to 1 month. If you freeze them, it’s best wrap several as a portion in plastic wrap and then double bag that before freezing. To serve again, thaw out a portion and pan-fry in a little bit of cooking oil to reheat & revive. Posted on Thursday, August 20th, 2015 at 9:18 pm. Last updated on August 29, 2015. Posted January 4th, 2019 at 4:37 pm | Log in to reply. Made these last night and they are still really good the next day. Our store had this weird “Ranch Cut” steak on sale and it worked out really well. Will make again. Posted September 1st, 2015 at 10:23 am | Log in to reply. I want to make these! You’re such an inspiration, Maangchi! My 7 year old and I like watching your videos together. Posted August 28th, 2015 at 11:40 am | Log in to reply. What a great looking lunch box! Yum! You’re kids were very lucky! Posted August 22nd, 2015 at 10:55 am | Log in to reply. If I were to use pork instead, do i use the same seasoning? My daughter doesn’t eat beef. Posted September 1st, 2015 at 2:47 pm | Log in to reply. Yes, you could use the same seasoning if you use pork. This recipe was originally posted on August 20, 2015 at 9:18 pm by Maangchi. It was last updated on August 29, 2015. The video was watched 580,962 times on YouTube & has 10,316 likes!